Brow Perfection Stencils are easy-to-use, reduces unwanted errors, and helps you to quickly shape the perfect brow. Each pack comes with FOUR different pre-cut stencils. 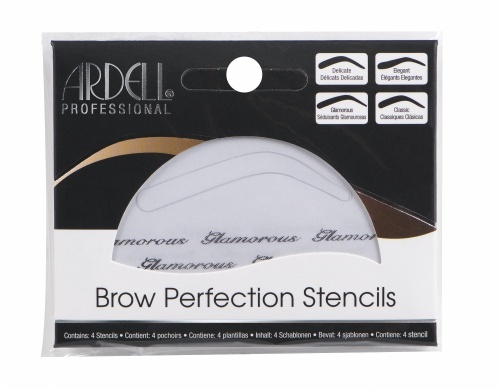 Ardell Brow Perfection Stencils (68065) are help you quickly shape the perfect brow. Four different pre-cut stencils mimic the most desired brow shapes for all face types. Painfully plucking can be a thing of the past. With the new Precision Shaper, perfectly defined brows are just seconds away. The Precision Shaper is a simple-to-use, no-mess tool designed for shaping the perfect brow. The unique handle design and small blade allow for precise movement underneath the brow where it is needed most. Ardell Brow Sculpting Gel (7ml) is a lightweight gel formula that keeps unruly brows in place. Contours and defines brows while providing all-day hold and conditioning. The precision mascara wand applicator shapes brows beautifully for a full and natural-looking brow.